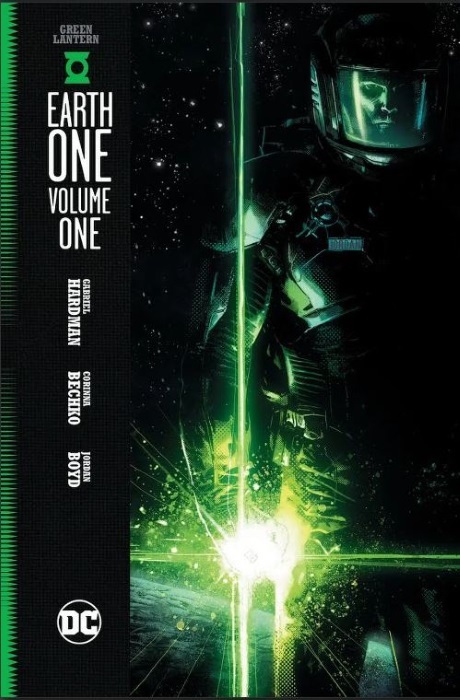 Here’s some good news: Green Lantern will be joining the Earth One collection of books next year. I have all three Superman titles and both Batman books, along with the Teen Titans (volume 1 – volume 2 is on order) and the Wonder Woman book (though that one’s still on my ever growing too read pile) so I’m looking forward to a new take on GL. I have to admit to a little disappointment, though, that it’s Hal Jordan in the starring role. One of the strengths of the GL stories is the sheer number of characters – any of the main GLs of Earth aside from Jordan (John Stewart, Guy Gardner, Kyle Rayner, Simon Baz, Jessica Cruz, even Alan Scott) could have just as easily played the lead. But Jordan is Green Lantern in the same way that Barry Allen is the Flash; other characters will come along but they’ll always cycle back to those, I suppose. Mind you, the set-up sounds promising. In this version, Jordan is an . . .
astronaut for Ferris Galactic, and all of the Green Lantern Corps have been murdered by the Manhunters – and its up to him to re-start the group. Ferris Galactic? Sounds like any future/alien tech of Earth One is a lot more accessible than in the main DCU. Posted on Friday, July 14, 2017 Monday, October 15, 2018 by GaryPosted in NewsTagged Green Lantern (Hal Jordan).